Let’s start the discussion on ZIKA virus. This virus is transmitted by the bite of a specific species of mosquito (the Aedes aegypti mosquito, to be exact). This is the same mosquito that can transmit dengue, and chikungunya. And it is showing up with increasing regularity, primarily in Central and South America. The primary public health goal is controlling the mosquito population and avoiding the bites (long sleeve, bed nets, DEET, etc. – problem being it actually tends to bite more during the day, than night like most mosquitos). The symptoms of ZIKA are relatively mild (fever, joint pain, muscular pain, eye infection and certain types of rash). More than half the patients actually do not show any symptoms. The problem is not for the average, healthy adult who gets infected – the serious problem appears to be for pregnant women, as the virus seems to be associated with issues in fetal brain development. I would strongly advise pregnant women to avoid traveling to Mexico, Central America or South America. There is no specific treatment or vaccine – patients who are felt to possibly have the infection should be advised to pursue bed rest, isolation, and hydration. They should stick with Tylenol; they should avoid aspirin and NSAIDs in case it is actually dengue, in which case there would be risk of internal bleeding. 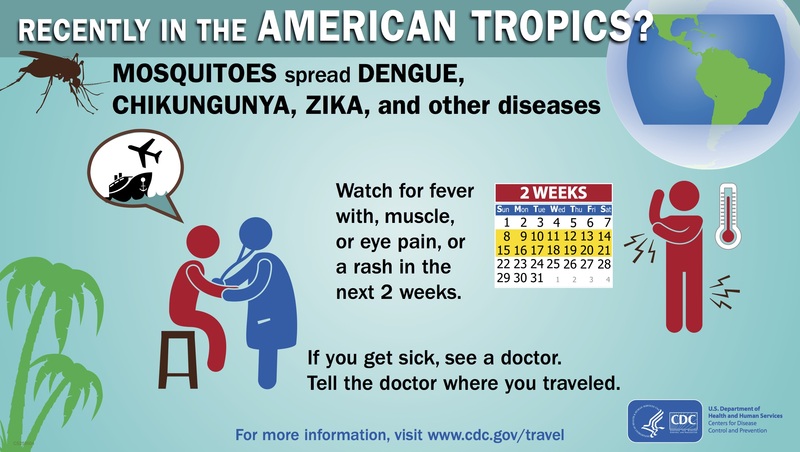 Travelers returning from these areas should be on the lookout for these symptoms, and make an urgent care appointment or an appointment with their primary care physician if they begin to show any symptoms.